This was not from me, although I'd agree readily to such demand. Kalabakan Member of Parliment, Datuk Abdul Ghapur Salleh said this during a briefing session in Merotai, Tawau recently (D.Express 9/5/2009). Of course SESB (Sabah Electricity Sdn Bhd) and TNB should compensate us. If electricity supply is disrupted in the peninsula, "the traders are paid for the losses they incurred." So, where is the fairness? Do SESB and TNB has different set of terms and conditions for consumer supply of electricity? If consumers don't pay up their bills, then what? Or put it the other way, what happen if the utility fails to supply power as stipulated in the contract? Something or someone has to give way. Experience has tought me that the utility would come up with sufficient reasons, excuses, and explaination everytime they deprive us of this necessity. "faults in transmission lines beyond our control.."
"intermittent problem considered not our fault.."
"transient voltage that is not common and cannot posibly by our fault.."
errr..excuse me, please keep the jargon to yourself and explain to me in a language less alien to me. I'm just a consumer, you know. Every organisation has the right to explain its side of the story, including giving excuses (if that's what the commoners would take as meaning of "explaination"). But wait, when did TNB took ownership of LLS (SEB) from Sabah Government? That's in 1998, what kind of their side of the story we are talking about here? Surely one would not wait for more than 10 years to come out with significantly better services; if 10 years is a time not sufficient, then I don't know what is. I can't imagine someone's hoping for a "puff!! then all things change to perfection" come 2020, our sacred date for Industrialised Nation vission. 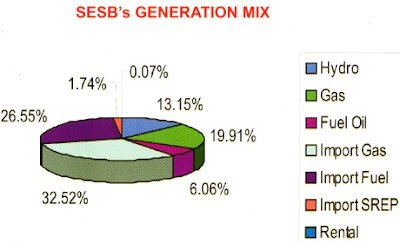 Current generation mix of SESB shows that half of the capacity is generated through Gas-fired, while a third through Fuel-fired generators (internally sourced + imported). Currently there is no Coal-fired generator in Sabah and recently TNB Chairman, Tan Sri Leo Moggie said that there is no other alternative practical option for Sabah to address the power shortage, apart from the proposed coal-fired plant. We are talking about construction of new plant and operational costs here, so it is not just about one time cost to build the plant. In terms of preparing for the future, SESB is not too bad. Plans such as shown above will take care of our need for at least untill 2015. Question is, how far in term of progress and commitment to their plan, have they gone at the moment? Plans are good but how about pruning the countless illegal power connection a.k.a theft. Sabah Water Department's NRW (non-revenue water) is the highest in Malaysia, if not in the world at more than 65%. What is SESB's NRE (non-revenue energy)? Could it be as bad? This diagram shows SESB's grid interconnection. 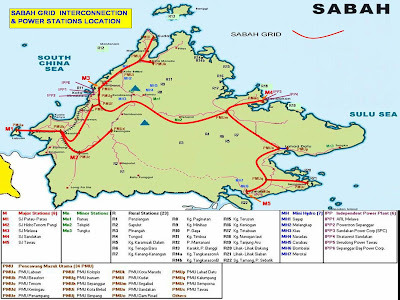 Major works have been completed in recent times to interconnect East and West coast of Sabah, I believe they have spent a lot of money upgrading and putting up PMUs at strategic locations. So, well done, we are actually "connected", people in the Eastcoast should enjoy supply of power "as much as" of those in the Westcoast. Note: I highlighted it in bold as we don't actually have that much of power here in the Westcoast as well. Note the grid in green which is the 275KV overhead transmission lines stretching from Kota Kinabalu to Sandakan. That would be about 300km in length. Add about, say 400km of similar lines and we are tapping power from Bakun already. Of course it would be costly, considering Leo Moggie's contention that at merely 500MW of current demand for Sabah, it is not viable to spend billions of Ringgit in transmission lines. Well, Tan Sri, you need some correction there. SESB MD, Ir.Baharin Din mentioned that the current "regular demand" for electricity in Sabah is at 650MW. 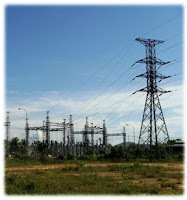 Surely, SESB can organise a power distribution restructuring if it decides to purchase power from Bakun, it is not so much about "commitment to supply to peninsule is justified due to the greater power demand", but rather the leaders' commitment to solve the power supply shortage in Sabah itself. It's partly economic viability of the whole project, but it is also partly on the social obligation of TNB as a sole entity in supplying electricity to the people. Because you are depriving others who might provide better services to the people, you must assume the social responsibility as well; every head has it's price! I must shout my mouth off now, so, let the bosses and leaders do the talking now. Read further below and you'll find that other political leaders have voiced out few things as well. Have they gone into silent mode now? That's for you to find out. maybe, things like Leader brandishes gun at negotiation talks with SESB maycould've had some bearing on the performance of, whoever. 'Blackouts got worse after SESB takeover' - CASH. You may not agree with him most of the time, but he barks regularly, at least. Uncertain: Decision, decision, decision. When will you come down hard on us? 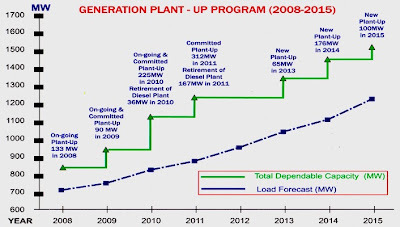 Bakun power to Sabah "not likely, (because) it is already committed" - TNB Chairman Tan Sri Leo Moggie. Minister Peter Chin - possibility to tap power from Bakun. Looks like ministers have differing answers when the rakyat is asking. So which one is a greener option? Bakun power and some restructuring or coal-fired power plant? 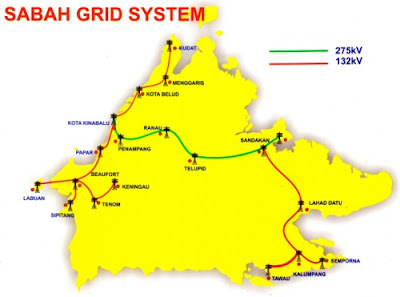 I appreciated your "Sabah Grid Interconnection & Power Stations Location" figure and am thinking of using it in my own writing...Any chance you could post an explanation of where it came from? If I'm not mistaken it was taken from SESB leaflet obtained during the write up. I think it was also available in their website in 2009, not sure about now. If you would identify yourself (your NGO), I could make the effort to verify this with an officer at SESB.